Find a Agio retail store in your local area using our dealer locator. 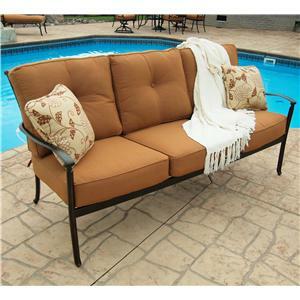 Stretch and relax by the pool with this spacious outdoor sofa. Removable plush seat and button tufted backrest cushions offer all the comfort of an indoor sofa with the added benefit of UV inhibitors and mold and mildew resistance. 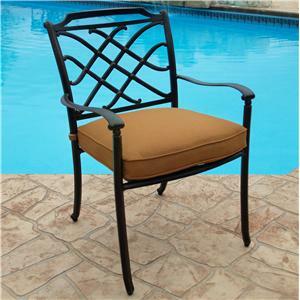 The sturdy Alumicast frame is finished in a hand applied antiqued black and features shapely arms and a decorative woven backrest for transitional style. 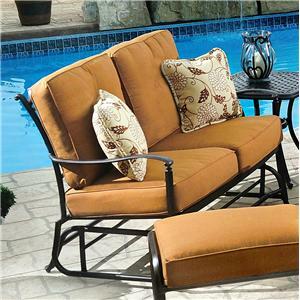 Seat cushions are upholstered in a butterscotch fabric with two floral pattern accent pillows. The Willowbrook Deep Seat Alumicast Outdoor Sofa with 2 Accent Pillows by Agio is available in the area from FMG - Local Home Furnishing. 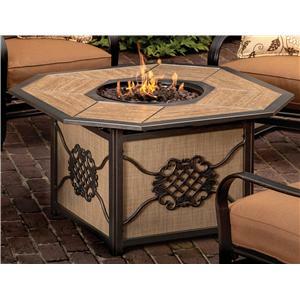 Create a comfortable, stylish gathering spot outdoors with the Willowbrook collection. 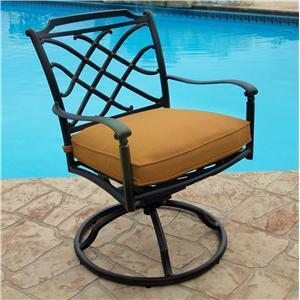 Built to last through the outdoor elements, each piece is crafted from sturdy rust free aluminum frames in black hand applied antiqued finish with removable cushions for easy maintenance. 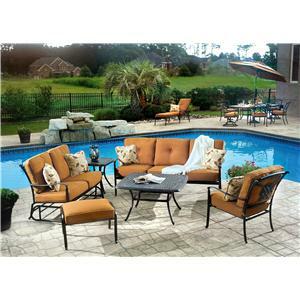 Deep seated lounge pieces and matching dining pieces include plush cushions in a butterscotch fabric with floral accent pillows with mold and mildew resistance. 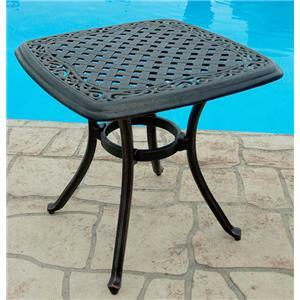 Also offering a set of occasional tables, the Willowbrook collection will fully furnish any deck, patio, or pool-side lounge. 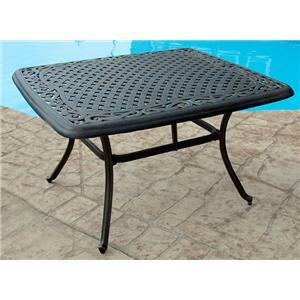 The Willowbrook collection is a great option if you are looking for Transitional Outdoor Furniture in the area. Fabric Options Cushions upholstered in a Butterscotch fabric with floral pattern accent pillows. 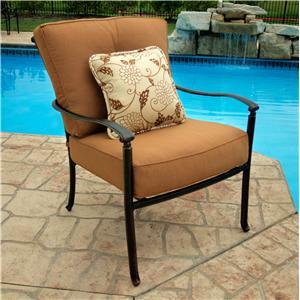 Cushions Cushions developed specifically for outdoor use and are mold and mildew resistant. Maintenance Clean your frames regularly using mild soap and clean, warm water. Do not use abrasive materials or cleansers. Maintain your frames by covering with commercially available furniture covers or storing out of the elements when not in use. Always clean and dry thoroughly before storing. Clean your cushions and slings by wiping up minor spills with a mild soap and a damp cloth. 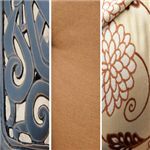 Although the fabric has been treated to resist stains, over time it may be necessary to use commercially available cleaners. Follow the manufacturer's instructions. 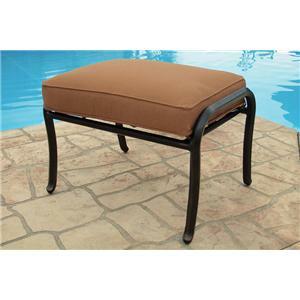 Maintain your cushions and slings by storing them in a dry area out of the elements or cover them with commercially available furniture covers when not in use. If your furniture is being used in an area where birds and trees are plentiful, covering the cushions is especially recommended. Browse other items in the Willowbrook collection from FMG - Local Home Furnishing in the area.